You’re at risk for this condition if you spend a lot of time reading decorating magazines or watching HGTV. The first sign is that you find yourself drooling over images of beautifully redecorated rooms, outfitted with thousands of dollars’ worth of new furniture and accessories. Then, as you realize you could never afford this kind of makeover on your modest personal budget, feelings of inadequacy set in. You become depressed at the idea that you’re going to be stuck staring at your bare walls and dated furniture forever. Fortunately, that isn’t true. There are actually plenty of ways to transform a room from top to bottom spending merely hundreds instead of thousands of dollars. In fact, with a bit of time and creativity, you can sometimes give a room a whole new look for less than $100. The best cure for a home inferiority complex is to learn more about how to redecorate on a budget. Once you see some of the great rooms other people have put together on shoestring budgets, you’ll realize that you can do the same. If you want to make your home look amazing without spending a fortune, the first thing to do is forget everything you’ve seen on TV and in magazines. When the decorators on TV make over a space, they almost always do it in the most expensive way possible. They throw out everything in the room, invest in high-end replacements, and hire contractors to install them. To redo a room for as little money as possible, you need to approach it differently. Instead of changing everything, your goal should be to keep as much as you can, while finding ways to make your old stuff look new. Instead of buying brand-new items, you should try to use things you already have or can pick up secondhand for a song. And instead of bringing in pros, you should do the work yourself whenever possible. Installing Vinyl or Linoleum Flooring. Cost for professional job: For a 10-by-10-foot room, about $700. Cost to DIY: $350. Potential savings: $350. Installing Hardwood Flooring. Cost for professional job: Around $8.50 per square foot, or $1,275 for a 150-square-foot room. Cost to DIY: About $5.50 per square foot, or $825 per room. Potential savings: $450. Installing a Kitchen Backsplash. Cost for professional job: About $850. Cost to DIY: About $300. Potential savings: $550. Painting Interiors. Cost for professional job: About $1,685 for an entire home (about 1,500 square feet). Cost to DIY: About $400. Potential savings: $1,285. Adding a Deck. Cost for professional job: To build a 10-by-12-foot deck, about $2,450. Cost to DIY: About $750. Potential savings: $1,700. Another perk of DIY is the satisfaction of being able to show off a project you did with your own hands. Economists even have a name for this phenomenon: They call it “the IKEA Effect,” after the store that specializes in ready-to-build furniture. A 2012 study at Harvard found that people consistently placed a higher value on things they had built themselves and saw them as equal in value to the work of professionals. In the same way, you’ll probably value a $100 flea-market table that you refinished yourself more than a $1,000 dining table that you just picked out at a store. Even if the flea-market table has a few streaky patches, it’s your table, and so you feel more attached to it than you would to a showroom-perfect table with a price tag to match. You can often change the look and feel of a room dramatically just by rearranging the furniture. For instance, if the first thing you see when you walk into your living room is the back of the couch, that big piece of furniture blocks traffic. Simply moving the sofa to the opposite wall can create a new focal point, improve traffic flow, and make the room look more inviting, all at the same time. And best of all, it costs absolutely nothing. If you can’t find a good way to make a comfortable arrangement of the furniture in the room, that doesn’t necessarily mean you need new furniture. Before you hit the stores, try “shopping your house.” Perhaps the very piece you need is already sitting in a different room, and all you need to do is swap it for one of the pieces you’re using now. In other cases, the problem isn’t that you need different furniture in the room – it’s that you have too much in there already. Instead of bringing other pieces in, you need to take some out. You can move the unwanted pieces to different rooms in the house, or just give them away to someone who can use them. Rearranging rooms is the main focus of the Use-What-You-Have school of decorating. Its founder, Lauri Ward, aims to help people create beautiful spaces with the furniture they have instead of buying a lot of new items. You can see several examples in their gallery of rooms transformed just by moving the existing furniture. Room after room goes from drab and cluttered, to elegant and cozy – and in most cases, not a stick of new furniture has been added. If you’ve searched your whole house and can’t find a suitable furniture piece for your room, don’t give up yet. Sometimes you can make what you want by turning an old piece to a new purpose. For instance, you could use a table as a desk, or a nightstand as a TV stand. Repurposing furniture often includes changing its look. For instance, you can repaint or refinish a wooden table before converting it to a desk – or you can take a whole piece apart and use the different parts in new ways. A Bookcase From Dresser Drawers. Apartment Therapy shows how a Chicago couple converted an assortment of free secondhand dressers to a custom-built bookcase. They removed all the drawers from the dressers, painted them white, and mounted them on the wall. Their books are grouped on these “shelves” by color. Shelving From a Dresser. If you’ve turned your dresser drawers into bookshelves, the rest of the dresser can still be useful – you can add wooden planks where the drawers used to be to create open shelving. At HGTV, you can see an old dresser converted to a colorful case for storing books and games. A Bar From a Bookcase. House Beautiful shows an antique bookcase that a New York couple repurposed to serve as a bar. It still holds a few books on the top shelf, but the lower three house liquor bottles and glassware. A Sink Vanity From a Dresser. If you can’t find just the right vanity cabinet for your bathroom sink, you can make one from an old dresser. HGTV shows an example made from an antique dresser to fit a traditional bathroom. Sometimes, it just isn’t possible to get the furniture you need by using something you already have. But even if you have to buy a new piece, that doesn’t mean it has to be brand new. There are lots of places to find secondhand furniture for far less than you’d pay in a showroom. Reuse Centers. If there’s a reuse center in your area, such as the Habitat for Humanity ReStore, it should be the first place you shop for your home projects. These stores sell a wide variety of materials left over from new construction, as well as materials salvaged from old buildings. You can find furniture, appliances, and lots of other home-remodeling materials for a fraction of retail cost. Thrift Stores. Thrift shops aren’t just for clothing. Many larger thrift stores, such as Goodwill, also sell home furnishings and accessories. Even at smaller thrift stores, you can often find small pieces for your home, such as lamps, glassware, and artwork. Craigslist. Your local Craigslist group is another good place to find home furnishings on the cheap. Check the “For Sale” section to see listings for furniture, appliances, antiques, and “household.” This last category is a catchall that can include anything from a lava lamp to a gas grill. Freecycle. There’s no better bargain than something that’s absolutely free. Freecycle is a worldwide network of local groups where people can pass along their unwanted stuff to others who can use it. It’s like a version of Craigslist where everything is free. To find a Freecycle group in your area, just go to Freecycle.org and enter your location. One of the cheapest ways to transform a room is to use paint. In a matter of hours, it can make faded or dingy walls look fresh again – or change their color for a completely different look. A gallon of high-quality paint costs around $35, and it takes only 2 gallons to cover a medium-sized room. So for just $70 total, you can make a whole room look like new. Stripes. By taping off sections of wall and painting between the taped lines, you can create horizontal or vertical stripes. The simplest way to do this is to paint colored stripes on a white wall. You can also paint stripes of one color, let it dry, and then paint the areas in between a contrasting shade. Ombre. If you’re more ambitious, you can give your walls an ombre effect, going from light to dark down the length of the wall. First, paint the whole wall a light color and let it dry. Then apply a darker shade of the same paint to just the bottom two-thirds of the wall. Once that’s dry, paint the bottom section in the darkest color. Stenciling. To create more complex patterns on a painted wall, use stencils. You can buy ready-made stencils at home stores or make your own from stiff cardboard. Just trace the pattern you want onto the cardboard and cut it out. Then, hold the stencil up against the wall and paint over it. You can use the same stencil over and over to repeat the pattern as desired. In this way, you can make a border running around the room or even cover the entire wall. Using a stencil is a good way to get the look of a patterned wallpaper for less money. Color-Washing. This technique gives a basic painted wall a more subtle, textured look. After painting the wall, go over it with a translucent glaze, which can be clear or tinted. Applying the glaze in short, random strokes with a brush makes it look more natural and less uniform. Sponging. This technique combines two paint colors with a sea sponge to create a random, mottled pattern. 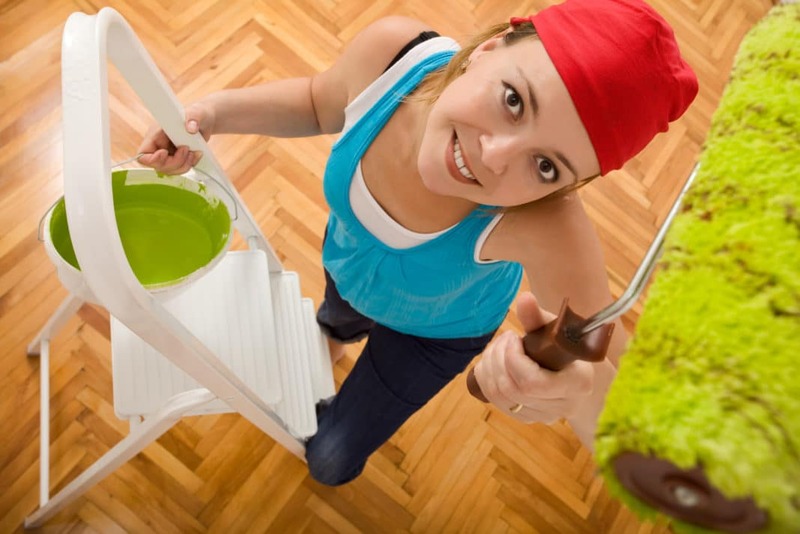 Start by painting the wall a solid color; then, dab a second shade of paint on top with the sponge. This top coat is often mixed with glaze to make it translucent. You can blend the sponged-on paint for a softer look, or leave it sharp for a stippled effect. Sponging Off. Sponging off is like sponging in reverse. It starts the same way, by applying a base coat of one color. Then, paint the entire wall with a second color and use the sponge to remove some of the paint while it is still wet. This gives a more saturated hue with just hints of the base coat showing through. Ragging. Ragging is similar to sponging, but instead of a sponge, you apply the top coat with a crumpled rag. As you dab the rag across the wall, the wrinkles in the fabric create irregular patterns. You can also use a plastic or paper bag in place of the rag. Rag-Rolling. This is a variant on the ragging technique. Instead of crumpling the rag, twist it into a cylinder and roll it down the wall. This creates longer streaks in the paint, much like the natural veins in stone. Dragging. This technique gives you long, narrow stripes running down or across the wall. Start by applying a coat of paint, followed by a coat of glaze. Then, take a long-bristled brush and drag the bristles along the glazed surface. If you use a special fine-textured brush called a strié brush, this technique can give the look of raw silk on your walls. Decorators often say you should design your room to highlight its architectural details, such as a fireplace or varied ceiling heights. However, if your space doesn’t have any details of this kind, you can create them – or at least the illusion of them – with paint. Create an Accent Wall. If your room lacks a focal feature, you can add one by painting one wall in a contrasting color. If just one wall is deep red or bright green while the rest of the room is white or beige, the vivid color will naturally draw the eye. Place furniture and art in the room to take advantage of this new focal point. Make Ceilings Look Higher. In many homes, the ceiling is painted white to make it appear higher. However, if you still feel like your ceilings look too low, you can create the illusion of more height by extending wall color a little way up onto the ceiling. If you have crown moldings, you can paint them to match the wall. If not, you can just add a narrow stripe of the wall color all the way around the edge of the ceiling. That will make the walls look taller while the ceiling appears farther away. Make Small Rooms Feel Bigger. In a particularly small room, a high ceiling is not desirable. Making the room look taller just calls attention to how narrow it is. Therefore, to make the room feel more spacious, you can use the same ceiling paint trick in reverse. Paint the ceiling a darker color than the walls, and it will make the ceiling seem lower – which in turn will visually push the walls outward. You can also extend the ceiling color a little way down onto the walls. Make Spaces Feel Separate. Sometimes a big, open room can feel too spacious. When one giant room serves as the kitchen, living room, and dining room, it’s not clear where one space leaves off and the next begins. Paint is one way to give each area its own identity. By painting two adjoining walls in a contrasting color, you mark off that corner of the room as a separate space. Paint isn’t just for walls either. It’s actually possible to transform nearly anything in a room by giving it a fresh coat of paint. One particularly common use of paint is to give old wooden furniture or cabinets a fresh look. For example, if you find an old dresser at a flea market, but it’s covered in faded, dull-green paint, the color doesn’t have to be a deal breaker. With just a few dollars’ worth of paint, you can have a crisp white dresser that looks brand-new. You can also can do just the opposite: make new, cheap pieces look like antiques by giving them a “crackle” finish. To do this, you need two contrasting colors of paint and a can of crackle medium. You paint on the base coat first, then the crackle medium, and then the contrasting top coat. As it cures, the crackle finish causes the top coat to crack in places, allowing the base coat to show through. Floors. You can conceal a battered wood or concrete floor with a sturdy porch and floor paint. This costs about the same as wall paint, but it’s strong enough to stand up to foot traffic. Painting a floor is a cheap, easy way to get the look of patterned linoleum or vinyl. You can paint squares in a checkerboard pattern, or use a stencil to create a more elaborate design. In high-traffic areas such as a mudroom or a garage, you can use tough epoxy floor paints, which cost around $50 a gallon. Counters. If you love the look of granite counters but can’t afford the cost, paint can give you the look you want for less. Special coating kits make laminate counters look like stone for less than $100. These kits include primer, several shades of paint, tools to apply them, and a coating that can stand up to heavy use. Applying all those coats takes time, but when you’re done, you’ll have the look of stone for less than the cost of new laminate. Appliances. If your kitchen appliances are scratched or dinged, or have a really dated color (like avocado), you can change their look with appliance paint. This specialty paint sticks to metal and can stand up to heat and wear. You can get appliance paint in a spray can for around $10, a large can for around $30, or a small touch-up bottle for around $5. Message Centers. Another interesting way to remake an appliance with paint is to paint your refrigerator door with chalkboard paint. This turns the door into a surface you can write on just like a blackboard. You can use it to write notes to family members or reminders about items to pick up at the store. You can also use chalkboard paint on walls and furniture. A quart of chalkboard paint costs $10 to $20. Metal Surfaces. With a $10 can of spray paint, you can change the look of anything metallic – light fixtures, metal furniture, even cabinet knobs and handles. You can make a damaged finish look like new or remake a dated brass fixture in a trendy finish, such as brushed nickel or oil-rubbed bronze. A Stenciled Floor. The Petersik family of Young House Love had a large walk-in closet and sink nook in their bedroom with dingy beige carpet on the floors. They wanted to replace the flooring, but they couldn’t afford to do it right away. So as an interim measure, they ripped out the carpet and painted a stenciled pattern on the wooden subfloor. They sanded down the wood, added a coat of primer and one coat of semi-gloss paint, and applied the stencil over top in a different shade. The whole process took five hours and used only $24 worth of materials. They later finished the floors with a sealant so they would stand up better to constant foot traffic. A Top-to-Bottom Kitchen Redo. Elizabeth Maxson of St. Louis writes in The Adventures of Elizabeth about how she moved into a new house with a hideous, damaged, dated kitchen. Since she couldn’t afford a full remodel, she used paint – on pretty much every surface in the room. She did a decorative finish on the walls, repainted the cabinets in black and white, added a pattern to the vinyl floor, and redid the counters using a technique she made up on the spot. The entire makeover cost less than $500. A Kitchen on a Shoestring. An article in Sunset shows a kitchen redone on an even more bare-bones budget: just $30. The homeowner transformed the dark and dated 1950s kitchen by repainting everything in bright, cheery colors. She made the cabinets yellow with blue handles and the appliances bright blue with orange knobs and dials. A Cheery Laundry Room. DIY blogger Kelly of View Along the Way redid her laundry room on a budget of $157, making most of the changes with paint. She created a stenciled accent wall and painted bold stripes on her vinyl floor. She also repainted a yard-sale cabinet, including the knobs, and several picture frames. Wallpaper comes in a huge variety of patterns, some of them far too complex to reproduce with paint. It also makes a durable surface that can be easier to clean than a painted wall. But unfortunately, wallpaper is a lot more costly than paint – about $30 per roll, or $1 per square foot. It also takes longer to put up on your walls. So when you’re on a budget, papering an entire room usually isn’t your best option. However, wallpaper can still have a place in a budget room renovation. You can get a big impact with just a small amount of paper by using it to highlight a small space. Wallpaper in Nooks and Cabinets. Instead of wallpapering a whole room, you can use paint on most of the walls and paper in a small area you want to highlight. One roll of paper is more than enough to cover a small alcove or the back of a built-in bookcase. In a budget kitchen makeover covered by This Old House, a homeowner removed some of her cabinet doors and covered the walls behind the shelves with a bright floral paper. This cost only $50 and was much simpler than trying to paint a design in such a cramped space. Wallpaper as a Backsplash. Many modern kitchen renovations feature a beautiful tiled backsplash as a focal point. Unfortunately, this type of tile is rather pricey – between $5 and $20 per square foot. However, you can create a durable and decorative backsplash on a budget with splash-proof vinyl wallpaper. For about $40, you can buy a 30-square-foot roll of wallpaper – enough to cover the whole backsplash area in most kitchens. Wallpaper as a Headboard. The focal point of a bedroom is usually the headboard of the bed. If your bed doesn’t have one, you can add one directly to the wall. Just cut a piece of wallpaper to the right size and hang it behind the bed, and you have a decorative headboard that takes up no room at all. Wallpaper on Furniture. Just like paint, wallpaper can be used to give a piece of furniture a new look. You can cut small pieces to cover drawer fronts, tabletops, or the panels of a wardrobe door. One of the quickest ways to make a room look fresh and new is to change the colors. Paint is the cheapest and most dramatic way to do this, but you can make almost as big an impact with fabric. Many different things in a room – including furniture, curtains, pillows, and rugs – are made of or are covered in fabric. Switching out these textiles is an easy way to add a bright color or replace a color you’ve grown tired of. New Bedding. Changing your bedding is a quick way to give a bedroom a new look. For around $50 or less, you can get a duvet cover and a set of shams that fit over your existing comforter and pillows. This costs less than buying a whole new quilt – and you can remove the new covers to launder them. New Pillows. You can add pops of color to a living room with a few bright throw pillows, which cost as little as $10 apiece. You can also buy new covers for your existing pillows for $5 to $10 each. Or, if you know how to sew, you can make your own covers. You can pay anywhere from $2 to $20 for a yard of decorative fabric, which is enough to make two sizeable cushion covers. Slipcovers. You can change the look of an upholstered piece completely by covering it with a new slipcover. Slipcovers vary considerably in price depending on the size and material. A basic, ready-made slipcover for a chair can cost as little as $30, while a custom sofa slipcover in a fancy fabric can cost more than $1,000. However, that’s still less than it would cost to replace or reupholster your furniture. You can also make a less formal couch cover by simply throwing a colorful sheet or tablecloth over the sofa. Recovering Chair Cushions. If you have a wooden chair with a padded seat, you can often remove the seat and cover it in a different fabric. This is a pretty simple job that requires no sewing skills. First, unscrew the bottom of the seat. Then cut a piece of fabric to fit it and fold it around the seat, right over top of the old fabric. Tack or staple the new fabric directly to the wood of the seat, and put it back on the chair. Bathroom Textiles. Since most bathrooms have no furniture, replacing towels and the shower curtain may be the biggest change you can make without remodeling. Shower curtains come in a wide array of colors and patterns, ranging in price from $5 to more than $50. A set of towels – two bath towels, two hand towels, and two washcloths – can cost anywhere from $20 to $100. Curtains. Nearly any window can change its look with curtains. A simple, sheer white curtain gives a light and airy feel, while a heavy lined drapery in dark satin creates a much more formal look. Simple styles are best for your budget, since plain panels can cost as little as $5 apiece. If you can’t find curtains you like in the store, you can easily make some out of any fabric you like. Only basic sewing skills are needed (or, in some cases, no such skills are necessary at all). If you have fabric that’s the right size for your windows, all you have to do is hang it from some curtain rings with attached clips. Rugs. Throwing a new rug on the floor is another quick fix for a plain room. High-end, hand-woven rugs cost thousands of dollars, but there are plenty of cheaper options. Chain stores such as Target, Walmart, and IKEA offer an assortment of area rugs in solid colors and simple patterns for $100 or less. You can also use fabric in more unusual ways. For instance, in the kitchen makeover shown at This Old House, the homeowner replaced the doors on her lower cabinets with panels of striped fabric for $50. The Petersiks of Young House Love used colorful floral fabric as a wall covering in their daughter’s bedroom closet, attaching it with a staple gun. Many older homes, from Victorian mansions to Craftsman bungalows, feature eye-catching woodwork. Their crown molding, chair rails, wainscoting, and carved newel posts all add visual interest to a room. However, in modern homes, details like this are much less common. If you’re wishing for some woodwork to liven up your walls, you can add your own. A bit of decorative woodwork takes a room from builder-basic to custom on a manageable budget. Base Molding. Even many modern homes have a bit of simple trim around the edges of the floor. It covers any gaps between the floorboard and the walls and gives the room a more finished look. However, if you’d like to give your floors a fancier treatment, you can add a second, smaller molding (called “shoe” molding) in front of the base molding. The simplest shoe moldings cost just $2 to $3 for an 8-foot length. Fancier carved moldings with more elaborate shapes range from $4 to $8 per 8-foot length. Crown Molding. Just as base molding creates a transition between the walls and floor, crown molding highlights the joint between walls and ceiling. Crown molding comes in a wide variety of styles and sizes to go with traditional, rustic, or modern homes. Having it installed professionally costs $4 to $8 per linear foot, but doing it yourself can drop the price to as little as $1 per foot for a simple molding. However, the job requires a miter saw, so if you don’t own one, that will add to the cost of the project. Chair Rails. A chair rail is a molding that runs around the room about 30 inches above the floor. This divides the wall into two sections and can make the room look wider. Often, the areas above and below the chair rail are painted two different colors, or one section is papered or paneled. Chair rail can cost anywhere from $1 to $12 per foot, depending on its style and material. It’s simpler to install chair rails than it is to install base or crown molding, so many DIYers can handle the job on their own. Picture Rails. A picture rail is set higher than a chair rail – usually about on a level with the tops of the windows in the room. It’s called a picture rail because it can be used for hanging pictures without putting nail holes in the wall. Instead, you attach a hanging wire to each side of the picture and attach the other end to a hook that hangs over the rail. Wainscoting. Wainscoting is paneling that runs around the room about halfway up the wall. The most common type is beadboard – narrow panels with thin grooves running down their length. Other types include horizontal planks, frames built out from the wall, and board-and-batten molding, which is evenly spaced vertical planks with one long horizontal plank at the top and bottom. At Young House Love, the Petersiks show how they installed board-and-batten molding in the hallway of their first home for only $57. The bathroom remodel at In My Own Style is a good example of how adding woodwork can completely change the look of a room. Homeowner Diane Henkler upgraded her basic bath with multiple types of molding. She added boards and battens to the walls, framed two plain mirrors with planks and crown molding, and used another piece of crown molding to make a window valance. The entire room redo cost less than $300. It’s amazing how much difference a small change can make in a room. Often, something as simple as replacing hardware or accessories can give a room a whole new feel for just a few dollars. Change Cabinet Pulls. Replacing the knobs on your cabinets can give your kitchen a dramatically different mood – and it’s a lot cheaper and easier than replacing the cabinets completely. Home centers offer a vast array of knobs and handles in every style you can imagine – traditional, modern, rustic, industrial – for $1 to $5 apiece. If you have your heart set on an expensive style but can’t afford to put it on every cabinet in your kitchen, consider changing just the drawer pulls. Since they’re closer to eye-level, they stand out more. Replace Your Faucet. Designers call the faucet the “jewelry” of a kitchen. And just like pairing a basic black dress with a dazzling necklace, switching out a plain faucet for a dressy one can make the whole room look much more elegant. Faucets come in a wide variety of styles – from old-fashioned and ornate, to sleek and modern – so you can find one to fit any kitchen. At home centers, most faucets range from around $50 to more than $200. If your home center doesn’t have a style you like at a price that fits your budget, try searching salvage yards for older faucets with vintage charm. Just take care to check their measurements and make sure they’ll fit your sink. Change the Shades. Changing the shade on a lamp can give both it and the room it illuminates a new look. New shades typically cost $10 to $30 each – but sometimes, all you have to do is make over the old shade. Better Homes and Gardens shows several ways to remake a lamp shade with ribbon, paper, fabric, or paint. Similar tricks work for ceiling light fixtures. At Homedit, you can see DIY shades for ceiling lamps made from old bottles, bamboo slats, paper, tulle, and even an old globe. Adjust the Lighting. Speaking of lamps, even the most exquisitely decorated room won’t look good if there isn’t enough light to see by. Often, all you need to fix the problem is higher-wattage bulbs in your existing fixtures. In other cases, you can move your lamps around to improve light distribution throughout the room. Add Accessories. Don’t overlook the power of accessories. A vase of fresh flowers, a green plant, a colorful bowl of fruit, or a couple of candles can brighten up a room for only a few dollars. Family photos can also make a good decoration, but they look best when they’re all in similar frames. A hodgepodge of different frame types – clear plastic, bare wood, painted wood, and metal – looks chaotic and distracts from the pictures themselves. When you choose the same material for all your frames, or paint them all the same color, your pictures look like they belong together. Clear the Clutter. Having too many accessories in a room looks even worse than having too few. When your mantelpiece is crowded with an array of souvenirs, seashells, greeting cards, clocks, and china figures, it looks like a big mess and you can’t give any one piece the attention it deserves. So the first step in any room makeover should be to remove all the accessories. Then, go through them one by one and determine how they can be best displayed. Keep matching items together, and form groupings with items of similar material, such as a collection of pottery. Once you’ve decided what looks good together, put back only those items, and find new homes for the others. This $250 bedroom makeover at View Along the Way shows how accessories can change the look and feel of a room. Five women transformed their mutual friend’s bedroom by bringing in a new duvet, curtains, art, and decorative items. Many of these items came from other parts of their friend’s house or from their own homes. They also repainted the walls, but it’s the accessories that really make the room. A room just doesn’t look complete without some sort of art. You can have beautiful furniture, walls, flooring, and window treatments, but if the walls are bare, the room will still feel unfinished. A single painting from a gallery can cost thousands of dollars, but fortunately, there are plenty of ways to adorn your walls for much less. For instance, you can buy poster prints of many famous paintings for $20 or less. Add a $20 stock frame, and your art is ready to hang. If you see a piece of art you like in a store or in a magazine article, you can often come up with an inexpensive way to reproduce it at home. For instance, at Young House Love, the Petersiks explain how they recreated some vintage subway signs that were selling for $1,600 each online. They just printed out the station names on their printer, glued the pages to painted wooden boards, and gave them a distressed finish. In fact, nearly anything can be art if you look at it the right way. For example, in the bedroom makeover described above, the five friends stretched different kinds of patterned fabric across several embroidery hoops their friend already owned. Grouped together on the wall, the hoops make an eye-catching focal point. By combining the various tips listed here, you can transform a room from top to bottom on a bare-bones budget. Read on to see examples of how people have used budget decorating methods in different rooms. At RICE Designs, you can see how a homeowner turned a room with dirty, damaged walls into a magical bedroom for her three-year-old son. She painted the walls a rich blue and decorated them with cutouts of clouds and stars. She also used paint to remake the secondhand bed and dresser. Most of the art in the room is handmade. The homeowner painted the alphabet on a plank she found in an outbuilding. One wall is covered with pages cut from an old children’s book, and a mobile of family photos hangs over the dresser. The room is altogether unique, and the homeowner spent less than $200. The Petersiks of Young House Love have also decorated several kids’ rooms on a budget. Perhaps their quickest room makeover is the one they did for their 8-year-old niece, Olivia. First, they brought in a secondhand desk and dresser, which they made over with bright pink paint, and a chair in white. They also dressed up the bed with a new duvet and a fabric-covered headboard. To finish off the space, they added a rug, curtains, a lamp, and several pieces of art. They covered two magnet boards in bright orange wrapping paper and displayed several “Olivia” story books face-out on a shelf. The entire room makeover cost $200 exactly. Redoing a bathroom can be an expensive job. According to HomeAdvisor, the average bathroom remodel costs just over $9,300. However, if all you want to do is improve the look of the space, you can do it on a much smaller budget – in some cases, less than $100. For instance, after their success with Olivia’s bedroom, the Petersiks later returned to make over her bathroom as a birthday present. At Young House Love, they show how they painted the walls a cheery green and added several playful accessories. A bright striped shower curtain, towels, and a rug punched up the space, and a discount-store chandelier added a touch of bling. Best of all, they took the room from drab to dazzling for only $82. Blogger Melissa Viscount of Two It Yourself made even more elaborate changes in her tiny powder room on a budget of only $84. She added a chair rail with beadboard-look wallpaper below and fresh paint above, as well as a new fabric valance she made herself. She also made a storage shelf with free wood scavenged from a shipping pallet. Other DIY accessories include Ball-jar light fixtures, a rope-covered wastebasket, and art made from leftover fabric. At Designer Trapped in a Lawyer’s Body, you can see a laundry room makeover on an equally bare-bones budget: just $71. The homeowner painted the walls, cabinets, and floor, and she refinished the counters with a concrete product. To dress the room, she borrowed curtains and a mirror from other rooms and added some DIY artwork. The only thing she bought new was one tiny rug. Kitchen remodels are even costlier than bathroom remodels. According to Better Homes and Gardens, even a “minor redo” costs around $5,000, and an “upscale overhaul” can come to $75,000 or more. But with some budget decorating tricks, it’s possible to give your kitchen a new look for just a few hundred dollars. For instance, at This Old House, you can see how two Massachusetts homemakers restored a 1920s kitchen on a budget of just $645. They painted the walls, cabinets, and paneling in white, then lightened up the space still more by removing some excess trim and converting two cabinets to open shelves. Then they spruced up the place with details including crown molding on the cabinets, a new light fixture, a new faucet, and stainless-steel outlet covers. The showpiece of the kitchen is a slate-tile backsplash, which they installed themselves by hand. TheKitchn features another budget remodel that turned a kitchen from oppressively dark to light and airy for just $500. The homeowners painted the walls and the dark wood cabinets and replaced the stone counters with butcher block they cut and installed themselves. More impressive still, they built many of the furnishings and accessories from repurposed materials. The hanging lamp was once a craft-store basket, the dining table is built from scrap wood and stair railings, and the backsplash is made from creatively reused yardsticks. A final story at This Old House features a dark, fussy kitchen redone in a farmhouse style for $468. The room started out with far too many colors, so the homeowners painted everything: walls, cabinets, counters, and floors. They removed the upper cabinet doors and trimmed out the lower ones with beadboard paper and plywood. To add more counter space, the couple built a rustic kitchen island from scratch. They used plain pine planks, which they “distressed” with a hammer to give them an aged look before adding stain. And for lighting, they built a chandelier out of repurposed mason jars, four-by-fours, and curtain-rod extensions. The most obvious advantage of budget decorating is that it lets you have an HGTV-quality room without an HGTV-sized budget. But redoing your room this way has another, more subtle advantage: pride of ownership. When you redo a room on a budget, you’re forced to be creative and think outside the box. Instead of just turning over all the decisions to a decorator, you have to use your own labor and your own ingenuity to get the job done with as few dollars as possible. So when you’re done, you end up with a space that’s truly your own. It reflects your work, your ideas, and your style much more than a room you merely spent money on. And that’s something you can actually feel great about. Have you ever redone a room on a budget? If so, what tricks did you use to save money?